We've come to an end! 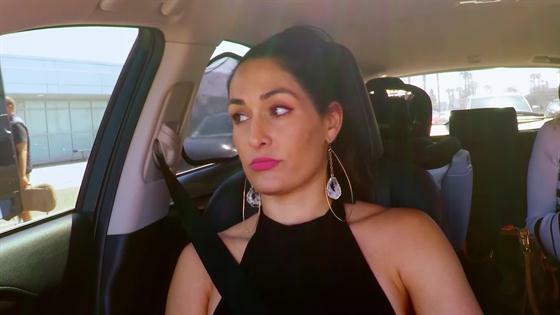 After one of the most eventful seasons yet, Nikki Bella and John Cena's love story is officially over. But don't worry, because this episode wasn't all bad news. In fact, things couldn't be better for Brie Bella and Daniel Bryan. After three years away from the ring, Bryan finally made his return and it was oh so sweet. "This has been a very long three-year journey and it gives me goosebumps," Brie shared. "Because that's all Bryan wanted and it's what he worked so hard for." As for Bryan, he could barely talk through his tears of joy. "I love it so much. You get it back and it feels like a gift," he shared. The waterworks were definitely flowing once Brie showed him video of his daughter watching him from home. "This is a moment I'll remember for the rest of my life," he revealed. As for his sister-in-law Nikki, things are also changing for the better, even though it will be very hard. "John and I might be calling off the wedding again," she told her twin over the phone. While the first breakup may have come as a shock, Brie's twin-tuition saw this coming. "I was extremely upset the first time. It was like I couldn't stop crying. But this time I feel they're in two different parts of their lives," Brie shared. As for Nikki, she can't deny that she's been feeling this way for longer then she cares to admit. "There is something that is making me feel like I cannot walk down that aisle right now," Nikki told her mom and sister. "That doesn't mean ever with him, I just can't do it right now." So she's saying there is a chance?! Maybe, but don't hold your breathe. "What this year has taught me and I hope people know, is that, like, if you don't feel like you're making the right decision, don't do it," Nikki explained. No matter what happens, she definitely earned the title of "fearless Nikki" in our book. As for what the future holds, no one can be certain, but don't count out a John and Nikki wedding just yet. "I definitely feel like I haven't been myself for a longtime. I feel like I'm starting the journey of finding me again," Nikki expressed. "And I just feel like in my heart, when I heal myself and figure out what's wrong with me, he will be there. And if he's not, then it wasn't mean to be." Watch the video above for this week's full episode recap!